Saddled up and ready to ride are (left to right): Phil and Lynn Wescott, Tom and Margaret Somenske with Leslie Gordon and Karen Swanson behind Margaret, John and Jamie Calhoun. The SaddleBrooke Ranch Riding Group headed out on their first ride of the fall season. 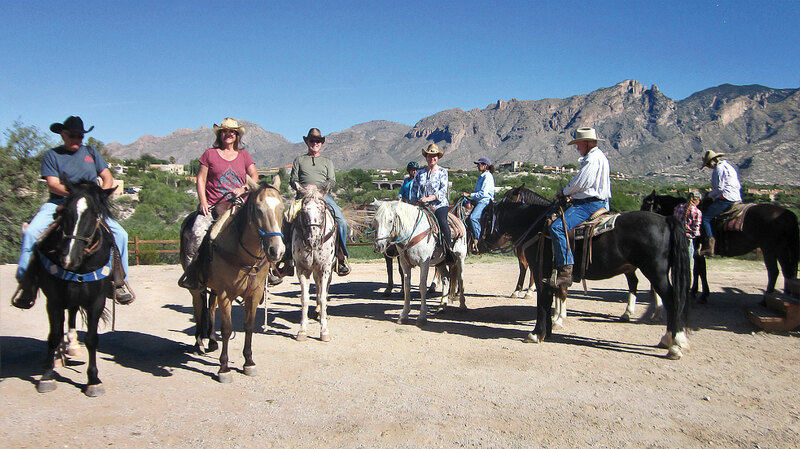 On Saturday morning, September 29, sixteen members of the group were at the Hacienda del Sol stable in Tucson for a morning ride. The group went in two shifts to make it easier and more fun. One group started at 8:00 a.m. with the second starting at 9:00 a.m. Hacienda del Sol stable is on the south side of the resort of the same name. While the setting may seem urban, the trail dropped down into a wide wash with lots of beautiful trees and vegetation. This trail is surprisingly secluded despite being nestled in an urban setting. Meandering through an arroyo below some truly lovely homes up on the bluff, it is a quiet, peaceful ride. On the one hour trail the group was able to ascend a bluff to enjoy a panoramic view of the surrounding mountains, views you don’t get speeding by in your car. After the ride, several of the members enjoyed lunch together at Hacienda del Sol Resort. The group’s October ride was on Saturday, October 27 at the Rocking K Stable east of Vail. This ride is typically through some nice grass pastures complete with beef cattle and up into a wonderful stand of saguaros. The December ride will be Saturday, December 15 at Old Tucson (Studios). Members will enjoy portions of the Saguaro West National Park as well as picturesque reminders of many famous Westerns. The group is working with the SaddleBrooke Ranch HOA club website to set up the opportunity to make reservations online at the club site. Members are encouraged to sign up for “Alerts” on the website as the group is working toward having the club website be where rides are announced and reservations for a ride are made.